Here we are, Week 17. After everything we’ve been through this season I can honestly say I’m a little sad it’s coming to an end. I’ll have more of an assessment of the year after the Bills close out the schedule this weekend, but all things considered, it wasn’t that bad of a year. 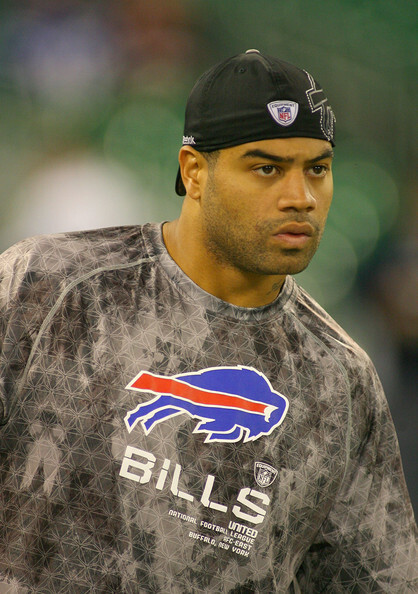 Shawne Merriman signed a two-year deal with the Bills on New Year's Day. Before we get to picks, here’s a look at the season standings with the Buffalo News guys. After a terrible start on my first season picking games against the spread, I’m back in contention with the guys who pick every year. It took me six or seven weeks to really get the hang of things, but I’ve done fairly well since then. I’m pretty good at my best bets, and if you’re wondering why I have one less game, it’s because I didn’t pick last week’s Saturday game. You don’t have to tell me that my record isn’t very good. I’m aware. But I hate losing. This week is my best shot to gain ground, and I’m considering taking drastic measures (picks continue in the playoffs, but there are far fewer games). Gaughan, McKissic and Wilson are the three I’m closest to catching, and really the only three I have any possible shot of catching. So with my picks this week, I’m going to include their picks as well. I may have to pick some teams simply to play devil’s advocate, opening up a chance to gain ground. That’s not cheating, that’s pulling the goalie. Carolina (+14 1/2) @ Atlanta–Carolina. I hope Jimmy Clausen throws for 800 yards. New England at Bills (+8)–Pats. Minnesota (+14 1/2) at Philadelphia–Vikings. San Francisco (+2 1/2) at St. Louis–49ers. Tennessee (+5) at Kansas City–This is where I usually lose on KC and other people make money on the Titans. Titans. Needed a good week and went 9-5.